MCMV infection accelerates GBM growth in mice. (A) Experimental overview. (B) Kaplan-Meier curves of GL261Luc2 tumor-bearing mice. Uninfected, n = 20; MCMV+, n = 19. P < 0.0001, log-rank test. Median survival is indicated on plot and shown in parentheses. 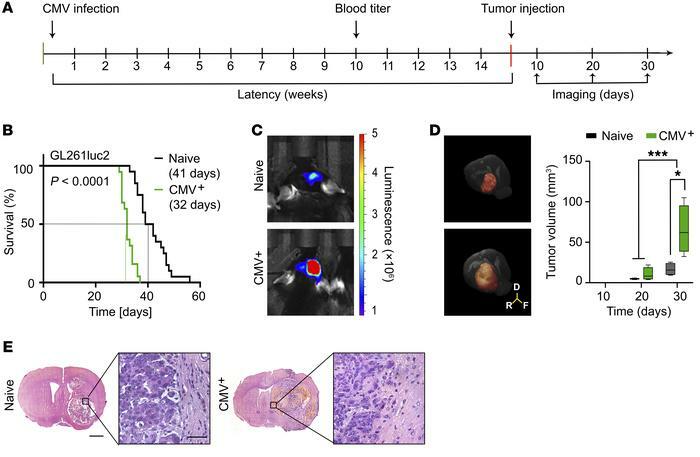 (C) BLI and (D) MRI analysis of tumor-bearing MCMV+ and control animals 30 days after tumor implantation. (D) Tumor volume rendering from MRI images (left), tumor volume over time (right). n = 3. Box extends from the 25th to 75th percentile, and the median is indicated by a horizontal line. The whiskers represent the maximum and minimum values. Statistical analysis was performed by 2-way ANOVA with Bonferroni’s correction. *P < 0.05; ***P < 0.005. (E) H&E staining of GL261Luc2 tumors at end points. Scale bars: 1 mm (left panels); 50 μm (right panels).